For as long as I can remember my Mom has been a thrifting expert. We’re talking about WAY before it was trendy. She made my brother and me go with her all the time when we were young, and as a kid I thought it was the most boring place on earth. Why would anyone want to dig through someone else’s old stuff? Then as a teenager I was mortified to be seen thrifting. What if someone I knew spotted me in the dreadful place? It would ruin my reputation forever! Now as an adult, I’m older and wiser (sort of) and absolutely love it. Thrift stores are my favorite places to shop! It’s a little bit like a treasure hunt. You truly never know what you might bring home. I even participated in a Goodwill fashion competition last year. Me and thrifting = serious business, people. Very serious. I know it can be a little intimidating the first time you shop in a thrift store. They don’t look or smell like a typical retail store. So, if you’ve ever tried to go in but left after your first whiff of “The Smell” (yes, they all have it) I’ve compiled a few helpful hints for you. And if you dig through the old junk long enough, I just know you’ll find some treasures too! 2. Decide what you’re willing to pay for items. 3. If you don’t love it, don’t buy it. If you wouldn’t buy it brand new in a normal retail store, don’t buy it at the thrift store. I’ve made this mistake a lot. It’s so easy to get excited about a brand new Ann Taylor dress for $4.00, even though I don’t shop at Ann Taylor. I would never end up wearing the dress, because it’s not my style. I swear I’ve had this conversation in my head: “I think I’ll buy that dress. NO! But it still has the tags on it. Walk away. You will never ever wear it.” Try to think through your purchases before you make them. Do you really need another Beatles t-shirt? Or another white vase just because you saw a similar one at Anthropologie and know what it originally cost? Yes, I recently asked myself both of those questions! The answers were Yes and No. Sometimes I’ll put something in my cart and walk around with it for awhile until I can really think through the purchase. Heck. I do that at Target too! Don’t bring home something you won’t wear or don’t have a special place to display. All our closets and cabinets are a little too full to begin with, right?! And you could use the $4.00 you almost spent on the dress for a frozen yogurt! The goal is NOT to end up on an episode of Hoarders. It’s a fine line! 5. Always try on clothes. Vintage sizes are different, so you can’t always go by what the tag says. Some thrift stores don’t have dressing rooms, but I’ve tried things on over my clothes right there in the store many times. Who cares? It’s the thrift store for goodness sake, and most of the people in there are a little cray anyway! 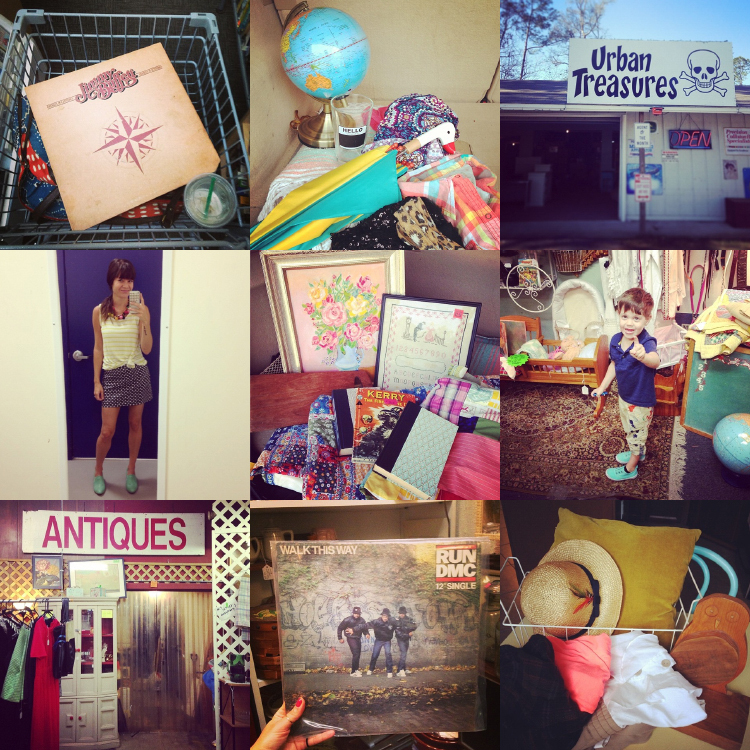 Know the difference between thrift stores, antique stores/markets, flea markets, and consignment stores. Thrift and antique stores are my favorites. But I rarely go to consignment stores. I’ve found that they mostly stock name brand items that are often out of style but not old enough to be considered cool and vintage. (Think early 2000’s Gap jean skirt. There are no less than 54 of those in every consignment store.) On the other hand, if you’re searching for great vintage clothes or old advertising signs you might just go straight for the antique stores. They’re usually a little more pricey than thrift stores, but they aren’t as grungy either. And antique stores are often organized by vendor. People rent a booth and fill it with stuff, so the prices usually vary a lot between booths. I bought a globe for Kingston’s room at an antique store for $7 and saw a similar one in another booth for $17. I felt so good about it that I bought something else with that $10 I “saved.” Ha! 7. Know how the stores work. Every store has different rules. For instance, if you see a piece of furniture that you want in a Goodwill store, take the tag off of it and take it up to the front counter. That’s how you claim it. It’s basically your way of licking it and screaming, “It’s mine!” (Do not lick the furniture in Goodwill.) The other day I was looking at the cool pink chairs below and walked away to think about them. When I came back a few minutes later the price tags were gone. Nooooo! I seriously have no idea what I would’ve done with them – we have more chairs than room in our house, but still. Also, some stores won’t sell an item without a price tag. It’s such a pain! But instead of taking it to the counter and trying to talk the cashier into giving it to you for 99 cents, find the employee with the friendliest face and ask them if they can put a price sicker on it for you. A lot of times they totally will! Even though I don’t think they’re technically supposed to. Also, a lot of stores have discounts on items with a certain color tag each day or week. 8. Keep an open mind and be creative. Spray paint is a thrift store shopper’s best friend. You and spray paint can create magic! Re-purposing is one of my favorite parts of the thrifting process, and furniture can be transformed so easily. Look for pieces with an interesting shape, but don’t worry about the color. You can fix that! Frames and lamps are easy to paint too. I buy a lot of pieces that seem random, but there’s (usually) a method to the madness. I collect Fiestaware, because color=happy, and I love picking up pieces that go with my collection here and there. I think it makes for a more interesting table setting when everything is a little different. If you opened my kitchen cabinets you’d find that about half the contents are new and the other half are thrifted, but they all work together! 10. Don’t forget about the internet. Over the last few years I’ve started shopping Craigslist more (mostly for furniture) and have gotten some great pieces at ridiculously good prices! I also shop a lot on eBay (they just sent me a Happy 10th Anniversary email-ha! I’ve been eBay-ing for a long time!) and have recently found some goodies at shopgoodwill.com. 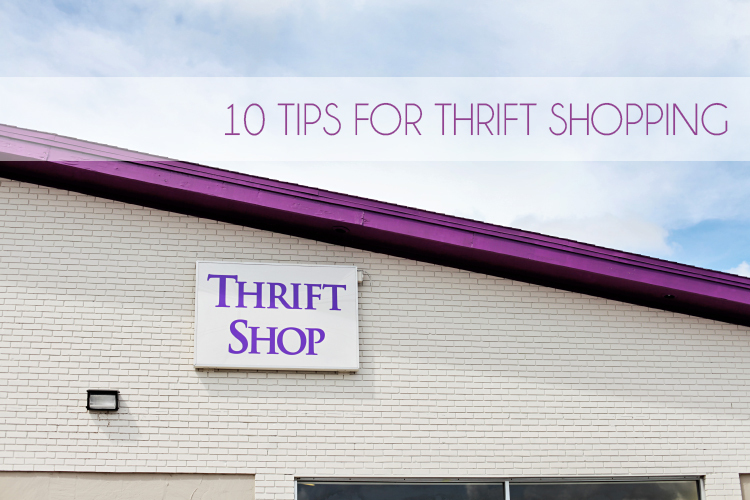 It’s thrift shopping without leaving your house. Bonus: I thought you might enjoy seeing how I’ve incorporated thrifted treasures throughout our home, as well as a few outfits that feature thrifted pieces! 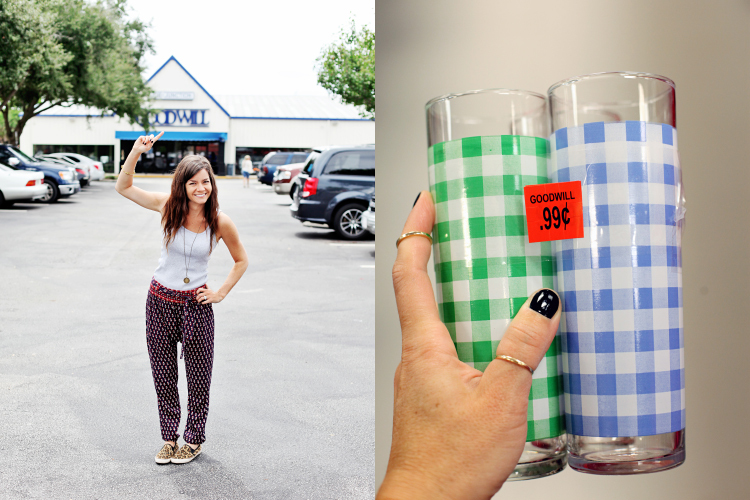 The Thrift Store of Jacksonville – Great place for vintage housewares. Southern Crossings – Globes, old flags, vintage clothing, signs, needlepoint pictures. Eco Relics – Discount building materials and architectural salvage items – (old doors, windows, hardware, and cool relics). Community Hospice – Old records, quilts, blankets, baskets. I hope this list is helpful for you and at least gives you a place to start. Do you have any favorite thrifting secrets? I’d love to about your favorite finds!